BIHere I am, holding my Note 4 and my Galaxy S5 for comparison. Times are hard for Samsung. Both Apple and Google have simultaneously launched gigantic new phones that are clearly designed to wipe out the market Samsung created. Samsung’s Note phablet once had the humongous phone space mostly to itself. When the Note II came out in 2012, it was greeted with derision by reviewers. One writer called it “comically large“. Two years later, and Apple’s iPhone 6 (5.5 inches) and Google’s Nexus 6 (5.9 inches) are clearly positioned to carve up Samsung’s Note 4 (5.7 inches). Indeed, Samsung’s high-end smartphone sales — led by the Galaxy S5, its best-known model (5.1 inches) — are now in decline, as shoppers appear to have held off to see what the iPhone 6 was like. And while the Nexus probably won’t sell as well as the Note 4, Google is increasingly trying to limit what Samsung does with the Android operating system that Google owns and Samsung uses. As longtime Business Insider readers know, I am a huge fan of big phones in general and the Galaxy S5 specifically. I abandoned my iPhone for a Galaxy S5, and haven’t looked back. I believe Apple was bonkers to keep making tiny, toy-sized phones for that two year period when it was obvious that Samsung was staking out a huge position among people who want to watch video on their phones, or use them for work — real work. So I was pretty keen to try the Note 4, even though I didn’t think it would be much different from the Galaxy S5. Its screen is only a little bit bigger, and the main difference, I presumed, was that the Note has a weird electronic “S-Pen” or stylus, that you can use to draw on the screen. I did not think that pen would be very useful (except as a device with which to stab Apple fanboys who believe that Apple didn’t copy Samsung’s big screens when it obviously did). It turns out — again! — size does matter, and bigger is better. And the S-Pen is amazing. If it had been produced by Apple, then Apple users would be raving over it. 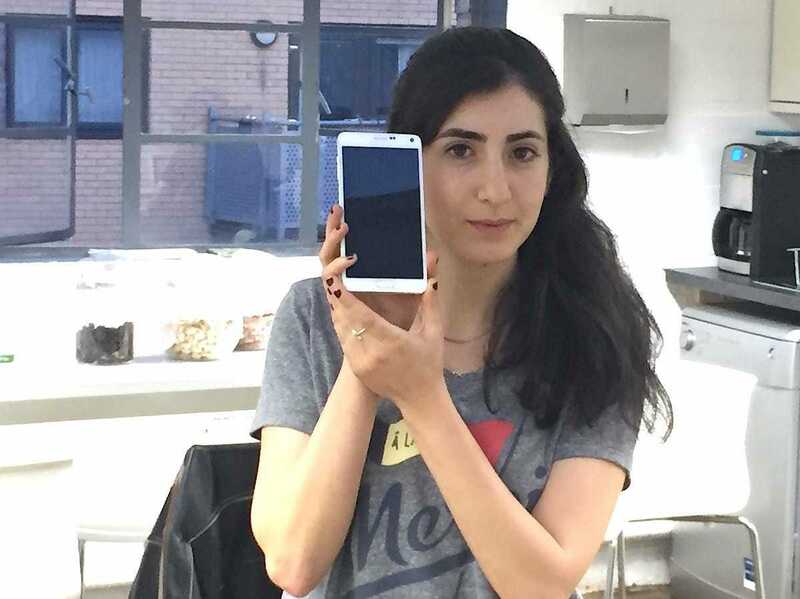 BIBusiness Insider UK’s London editor, Dina Spector, is eclipsed by the Samsung Note 4. First, let’s talk about the size. 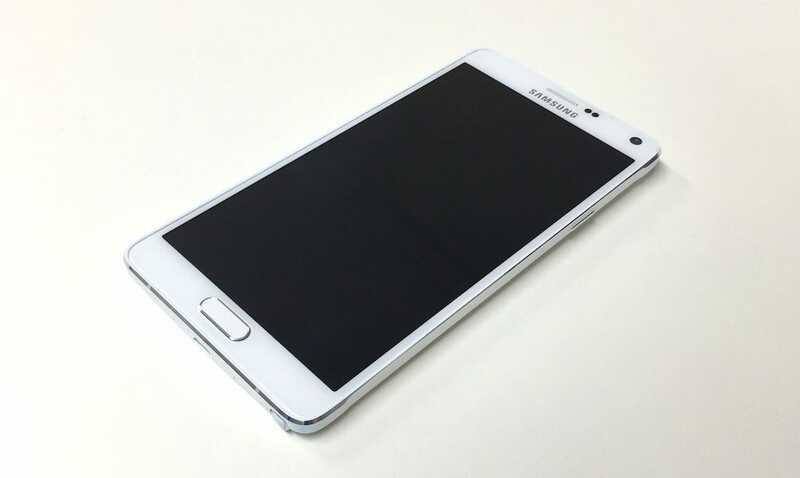 The Note 4 is so big, women often have difficulty using it because it’s bigger than their hands. It’s bigger than their heads, too, as this photo shows. Note that the phone is almost as big as my colleague Dina Spector’s entire face. Yet everyone I’ve ever met, women as well, who uses a Note says they love it. I’ve always been curious about that — why do people like it so much, if it’s so unwieldy? Turns out that although the screen is bigger, the frame isn’t that much bigger. So if you like 5-inch-plus phones you’re going to like the Note 4. And then there is video: Watching movies on the Note 4 is pure pleasure. People using iPhone 5 and 5S models have no idea what they’re missing. I am not making this up: 40% of YouTube’s traffic is from mobile devices. That’s what phones are for now, watching video. And video is rubbish on a small screen. It’s like owning the biggest yacht in the harbour. One cool thing about the Note 4 is that if you want to draw attention to yourself, just pull it out of your pocket and plunk it down on the table in any social setting. It’s so massive, it just stops the conversation right there. It’s like sitting at a bar in a Hummer. “Is that the Note 4?” A waiter asked me at dinner one evening. He had the Note 3 and wanted an upgrade. Everywhere I went, people wanted to play with it and try it out. Owning the Note 4 is like owning the biggest yacht in the harbour. Everyone wants to go for a ride. Let’s talk about that weird pen thing. Jim Edwards / Evening StandardClick to enlarge: What you can’t really see here is the wide range of brush strokes that the S-Pen is capable of. The Note 4 has gotten a lot of stick because it comes with the S-Pen, the strange electronic stylus that lets you write on the screen. You can write notes or use it to draw things. Kids love drawing with the S-Pen. I gave my phone to my nieces at lunch one day — they’re aged 7 and 9 — and we got an hour’s silence out of them as they learned to draw. Kids love to draw. And the S-Pen never runs out of ink. Unexpectedly, I quickly learned to love the pen too. I hadn’t spent much time drawing in years. 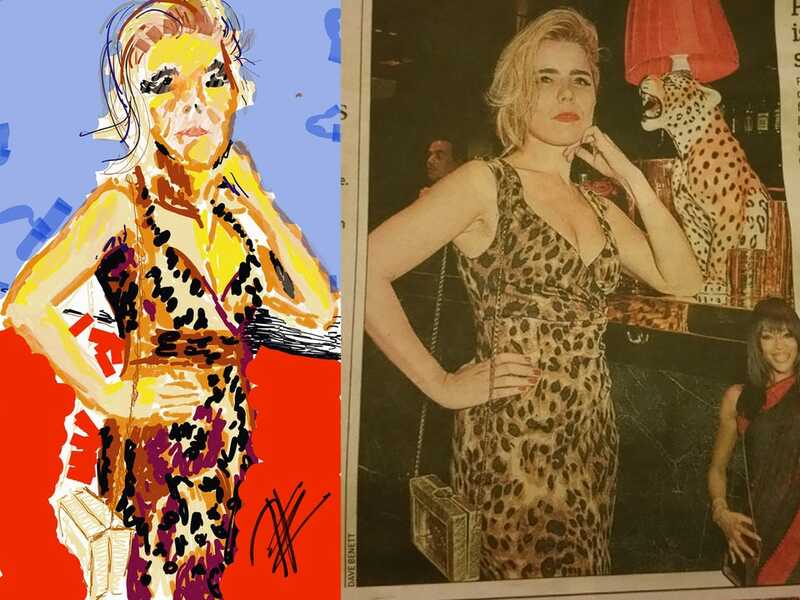 But within 45 minutes, I knocked out this “painting” of Paloma Faith, the singer. I’ve shown it here with the newspaper photo I was copying. Let’s ignore my dubious artistic skills. Concentrate on the fact that I was able to do this in just a few minutes. And it was fun, and easy. Creative people — artists, designers, etc. — need to think really seriously about the Note 4. If I was a more creative person, this would replace my pen and paper in an instant. Samsung ought to make more metal phones. The metal edge is a major advance, too. I used to not care what phones were made of. I think it’s bizarre to buy a phone based on its case. You’re paying for the operating system and the hardware, like the camera, not the case. But the metal edge actually makes the phone feel much more solid and precious. I’ve previously scoffed at critics who think iPhone is superior because it’s made of metal, or that Android phones are too plastic. But the difference in quality between the Note and the Galaxy is tangible in your hand. The Galaxy felt cheap by comparison. (And it isn’t. 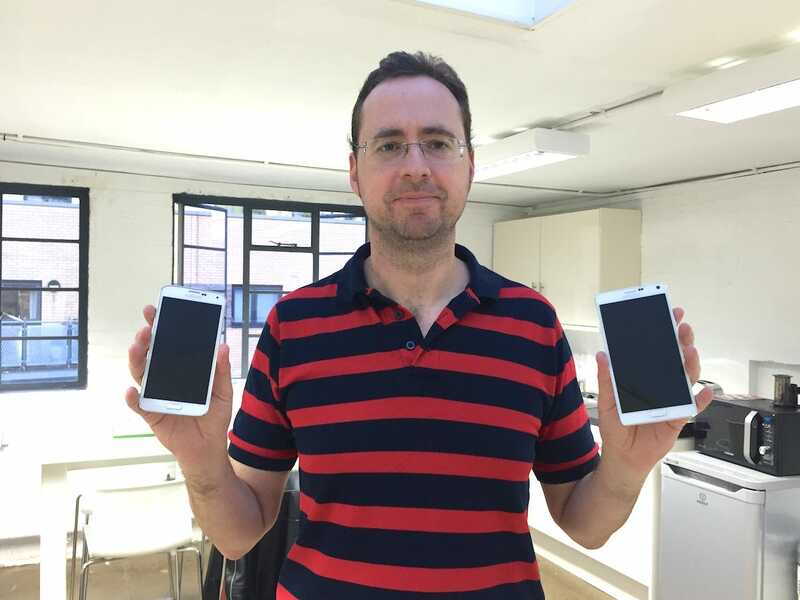 Both phones are more than £500/$US700!) 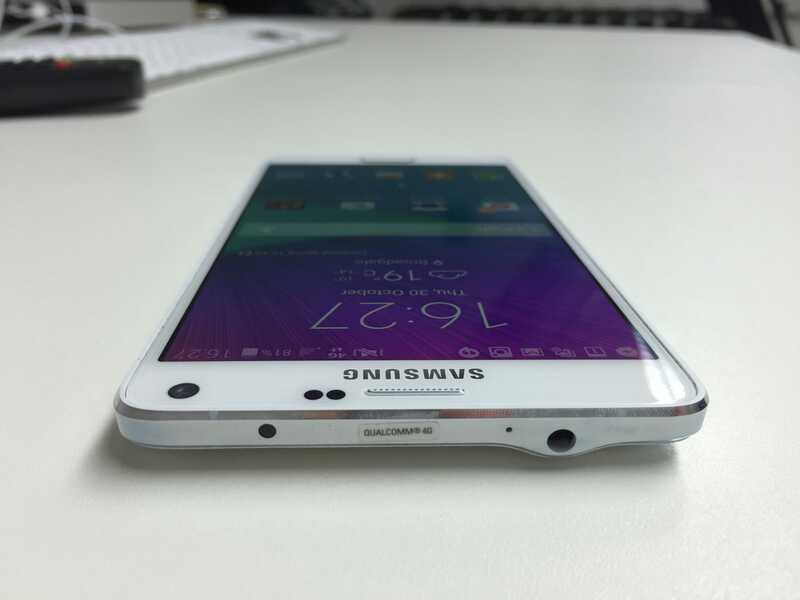 So now I’ve changed my mind — a little bit of metal in the outside design has gone a long way on the Note 4. The camera is amazing. The photos are huge. The screen is huge. And the on-board photo editing suite is great. It’s a 16 mega-pixel camera, which is technically more powerful than the iPhone 6 and 6 Plus camera. I’d argue that iPhone photos still seem a warmer than Samsung ones. But at this point, however, the Samsung v. Apple camera debate is becoming pointless — they’re both packing such power that the differences are minuscule. The things I didn’t like. OK, it’s not perfect. There are a bunch of things that I’d change on this phone if I were Samsung. Firstly, Samsung seems to jam everything it can onto the phone, whether it’s a good idea or not. So while the S-Pen is great, and the music playing app is decent, there is also a bunch of stuff that keeps popping up that I didn’t ask for. S Voice and the Flipboard based magazine were the two most intrusive Samsung apps that bugged me. I didn’t want to give the phone back. Overall, I loved this phone. I didn’t want to give it back (it was a review unit). I hope Samsung keeps making them, even though its high-end business has shown some recent weakness. It was really fast and reliable. I didn’t experience any time when I asked the phone to do something and then stared at it while I waited for the app to load. My Galaxy felt underpowered by comparison. In all honesty, when I am forced to choose my next phone, it will be between the Note 4 and the iPhone 6 Plus. It will be a tough call — and ordinary users will be thrilled with either one. I love the Android interface — it feels like the phone can do so much more than an iPhone can. I get that iPhones are good phones. But iOS 8 is boring. Android has all sorts of weird stuff packed into it, which keeps the phone interesting. So I might just stick with Android. I’m tempted by Google’s new stripped down Androids — Samsung needs to get on board with this “pure” Android idea — but I think I’ll go with the Note 4 or its successor. That S-Pen really was an unexpected treat.